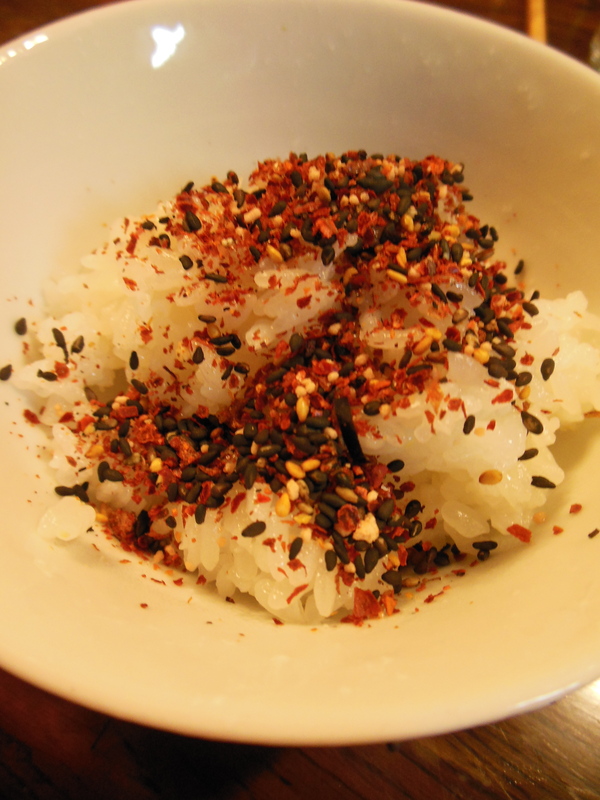 Furikake are toppings that are sprinkled over rice. Most of the times at home we are eating a bowl of white rice. 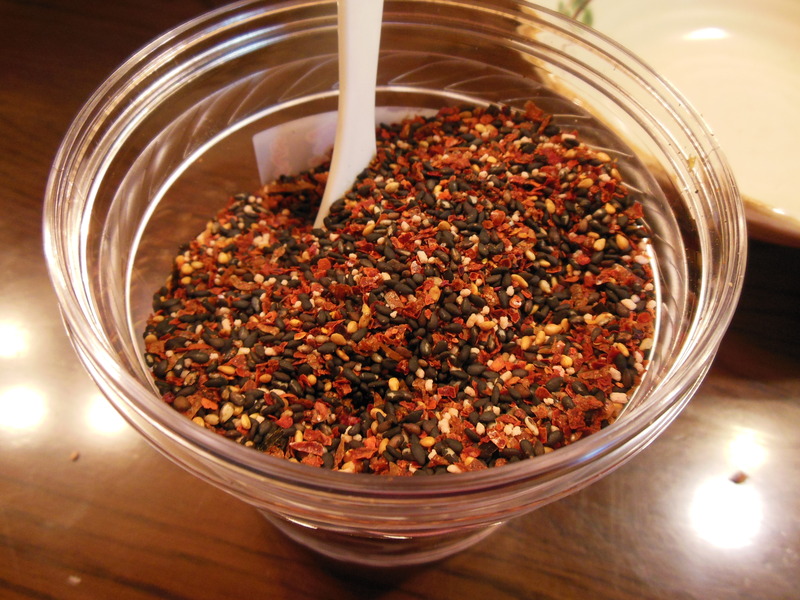 But once in a while we’ll sprinkle on some furikake just to spice things up. This Taberu Tōgarashi is in the genre of the taberu rayū, which we also like to have from time to time. We try to keep this Taberu Tōgarashi in the back of the pantry and not on the table. Why? Because when we do use it we end up eating two to three bowls of rice at a time. It’s that delicious. We came across this at Tsukiji Market and picked one up to try about a year ago and now it is a staple in our pantry. Ingredients include dried red chili peppers, black sesame seeds, yukari (dried purple shiso), apricot, smoked and dried fish flakes from skipjack tuna and Pacific mackerel, salt, nori, and salt. On the palate you get the heat from the dried red chili peppers, some tartness from the red shiso and apricot, and nutty from the sesame seeds. The capsaicin in the peppers is what makes this so addictive. The package suggests serving it with noodles, fried rice, onigiri, or as ochazuké. I have yet to try it on pizza, but I imagine most dishes that use Tabasco would also do well with this Taberu Tōgarashi. Taberu Tōgarashi is sold at some shops at Tsukiji Market. 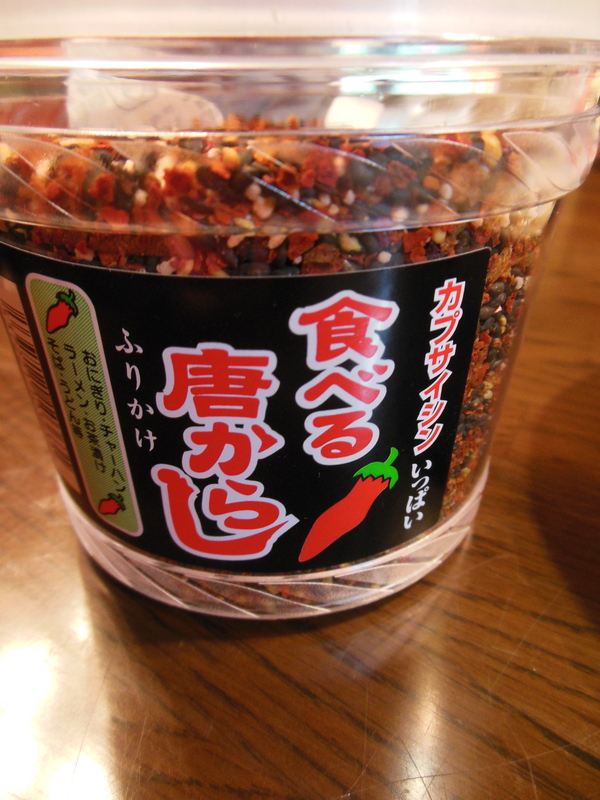 We buy ours at a great little shop called Karaimonya, which specializes in chili peppers and all things spicy.